Big Dope is out “fat walking” so I take this opportunity to communicate. As a public service, I am preparing a draft re-write of the Arkansas Criminal Code. I could use suggestions for §(a)(B).201-Shopping. An example: for the crime of blocking the aisle in a supermarket while talking on a cell phone, should the punishment be a few years of hard time or a long sentence of house arrest? Another: for parking with one set of tires on the line of the parking stall, would 500 hours of community service be sufficient? I’m thinking a six-month sentence for the crime of waiting until the cashier announces your total before beginning to rummage in a purse looking for a checkbook or a wallet for a credit card. Fair? Men shopping without a Certificate of Graduation from Husband School would be permanently barred from the venue, freeing up a lot of everyone’s time. Sound appropriate? Finally: I am proposing that the following be posted at conspicuous locations in all stores. 1. IF YOUR POSTERIOR IS WIDER THAN YOUR SHOPPING CART, PLEASE WALK SIDEWAYS THROUGH THE AISLES. 2. PLEASE KEEP ALL WEAPONS CONCEALED UNLESS ACUALLY OBSERVING A SHOPLIFTING IN PROGRESS..
5. A MAXIMUM OF FIVE CHILDREN MAY RIDE IN A SHOPPING CART AT ONE TIME. 6. SHOPPERS TASTE-TESTING FRUIT SHOULD NOT RETURN PEELS, CORES, SEEDS, OR OTHER REMNANTS INTO THE DISPLAY BINS. 7. 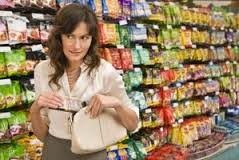 PLEASE TAKE WRAPPERS FROM CANDY CONSUMED BY YOUR CHILDREN WHILE SHOPPING TO THE CASHIER TO BE ACCOUNTED FOR AT CHECKOUT. 8. PLEASE COVER ALL TATTOOS EXPRESSING DEATH THREATS TOWARD THE PRESIDENT OF THE UNITED STATES WHILE SHOPPING AT THIS STORE. 9. PLEASE REFRAIN FROM CONVERSING WITH OTHER SHOPPERS WHILE CHECKING OUT. 10. PRACTICAL JOKES SUCH AS PLACEMENT OF CONDOMS, LAXATIVES, OR FEMALE UNDERGARMENTS IN ANOTHER’S CART ARE STRICTLY FORBIDDEN. As always, I wish you a feeling of happiness day. (Editor’s note: He, of course, means “pleasant”). a "Citizen's Kill." - C.W.